Special Containment Procedures: SCP-677 is currently in the vicinity of Saturn’s orbit. Due to its attraction to Earth, it is expected to land back on the planet by the year 2███. At least one telescope will be trained on SCP-677 to monitor its movement. When reentry occurs, a team will be dispatched to recover the object, whereupon it will be dismantled and returned to its storage locker at Site ██. 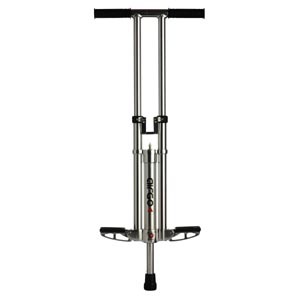 Description: SCP-677 is a silver, ████-brand pogo stick that has significantly visible wear. Etched onto the side is an engraving reading “For Mike: Happy Travels!” SCP-677’s frame appears to be indestructible by all normal means, though it can be dismantled. The spring itself, oddly, is easily broken, though it can be replaced with any spring that will fit around the SCP’s shaft. The type of spring used appears to have no effect on SCP-677’s mechanics, so long as it is unbroken. When used, SCP-677 will immediately jump to unpredictable heights and speeds, regardless of the degree of power applied to the jump. Various heights, ranging from two centimeters upwards, have been recorded, and the highest obtained speed to date, based on calculations of SCP-677's current trajectory, is █████. Maximum obtainable speed is unknown. Additionally, due to some unknown mechanic, SCP-677 always lands within ██ meters of its original launch position, regardless of the time, direction or speed of its trajectory. With the permission of Agent ████, Personnel 2/677 removed SCP-677 from containment and assembled it, claiming that he was “gonna break the world record for Extreme Pogo.” After donning a parachute and attaching several restraining devices between him and SCP-677, Personnel 2/677 began jumping. After eight such jumps of varying heights, SCP-677 immediately shot into the air, breaking its restraints and [DATA EXPUNGED]. Personnel 2/677 was given medical treatment and severely disciplined.